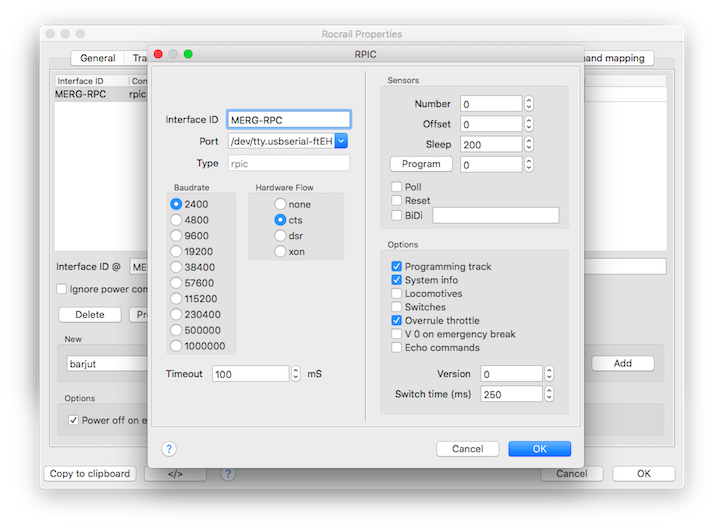 The MERG RPC system is commonly used as I/O, 32 byte output and 32 byte input. The refresh between the RPC system and Rocrail is periodically done, approximately 10 times per second. The 32 output bytes are saved on shutdown and restored at startup. Type 0: All Bytes Out, All Bytes In. Select the RPIC Controller in Rocrail. Give the controller a unique Interface ID, and select the communication port. Restart Rocrail to make this newly added library active. Outputs, switches and sensors are Flat addressed, the port and gate fields are not evaluated. Only Single Gate switch motors are supported. Address range is 1…256, mapped to 0…255, for both outputs and inputs. Use the Sensor Monitor for checking the sensor addresses.